If You Are Selling Your House in Springdale. 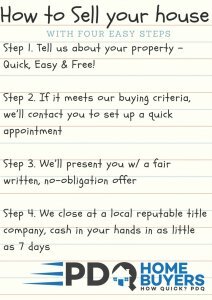 We have four easy steps that you can follow to help you sell your house FASTER! it will get rid of all the frustrations selling your house will do to you. Forget the agony and frustration of selling your property. We offer a quick and hassle free alternative to your real estate needs. No Fees, No Comissions and we take care of all closing costs. Unlike the traditional way of selling your property — which will take you months to sell — in as little as 7 days we will give you cash for the property you would like to sell. We work differently at PDQ Home Buyers. When you contact us and submit the short property information form (below), we’ll give you a fair all-cash offer on your house within 24 hours… and the best part is: we can close whenever YOU choose to close – it’s entirely up to you. It doesn’t matter what condition the house is in, or even if there are tenants in there that you can’t get rid of… don’t worry about it. We’ll take care of it for you. And if you need the cash quickly, we can close in as little as 7 days because we buy houses with cash and don’t have to rely on traditional bank financing.